Coconut rice with pineapple | The Bee's Kitchen: Tasty. Home. Cooking. This dish brings a new decadent twist to the regular rice dish served during meals. While preparing the rice, I was trying to create a sweet and crunchy dish, based on the natural sweetness of the fresh pineapple mixed with the coconut. Rinse the rice under cold water a few times and drain until the water runs clear. In a large saucepan, heat up the coconut milk, water and salt over high heat. Once the liquid starts to boil, stir in the rice and lower the heat. Cover the pot and cook until the rice becomes tender for about 35 to 40min. Turn off the heat and let it stand for 20 minutes. Fluff with a fork. 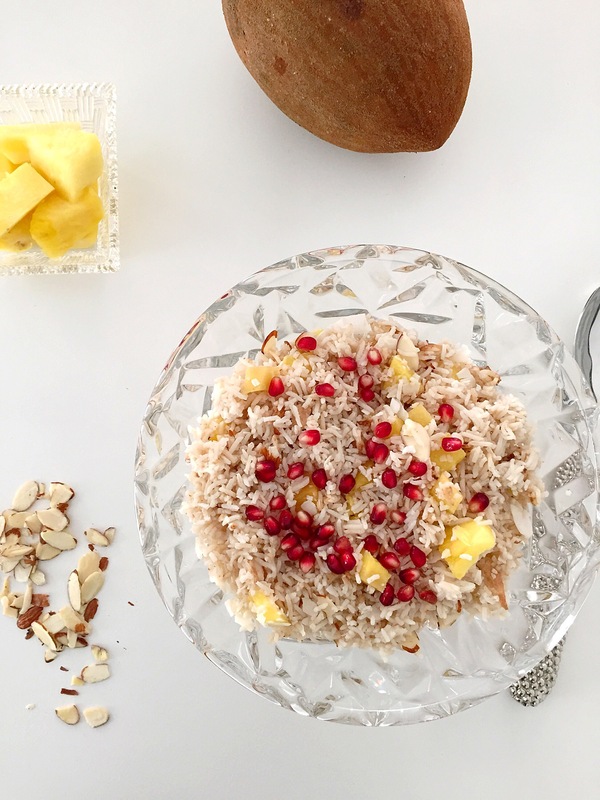 Add the chopped pineapple, coconut flakes, almonds and top with pomegranate seeds.